As badly as I want to start off this review on a sad note, I just can’t. 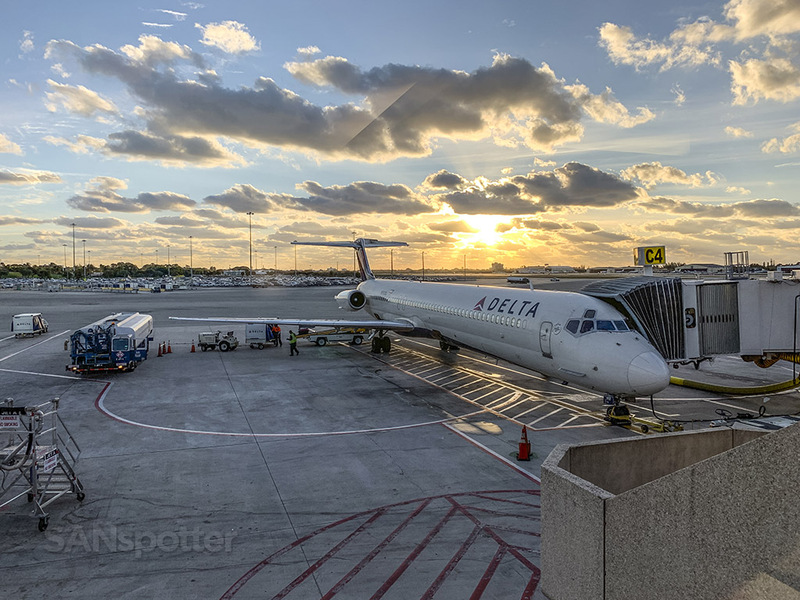 You see, I’ve got a sneaky suspicion that this may have been my last Delta Air Lines MD-88 ever, and it only feels natural to me to write a sappy farewell post to the old gal. However, I’ve learned my lesson with the gradual disappearance of Virgin America over the past few years. It ain’t over until it’s really over, and I’ve lost count of how many “farewell” trip reports I’ve written for the VX brand since 2016. It was a messy goodbye that went on for far too long. Due to be completely retired from the Delta fleet in less than two years, there’s a pretty good chance that I’ll never get a ride on the MD-88 again. But as confusing as it is, there’s also a really good chance that I might. I have absolutely no idea how it’s going to happen, but I am going to hold off on a potentially premature (and embarrassing) farewell post. For now. As far as I’m concerned, this is just a regular ‘ol trip report about a regular ‘ol Delta Air Lines MD-88. Delta Air Lines MD-88 side view illustration by norebbo.com. Seat map of this Delta Air Lines MD-88 courtesy of seatguru.com) showing my seat (31E) for this flight to ATL. Of all the amazing airports on this planet, I’ve got a soft spot in my heart for little ‘ol PBI. It’s essentially my second home airport considering that my parents live in fairly close proximity to it and I’m there at least once a year. 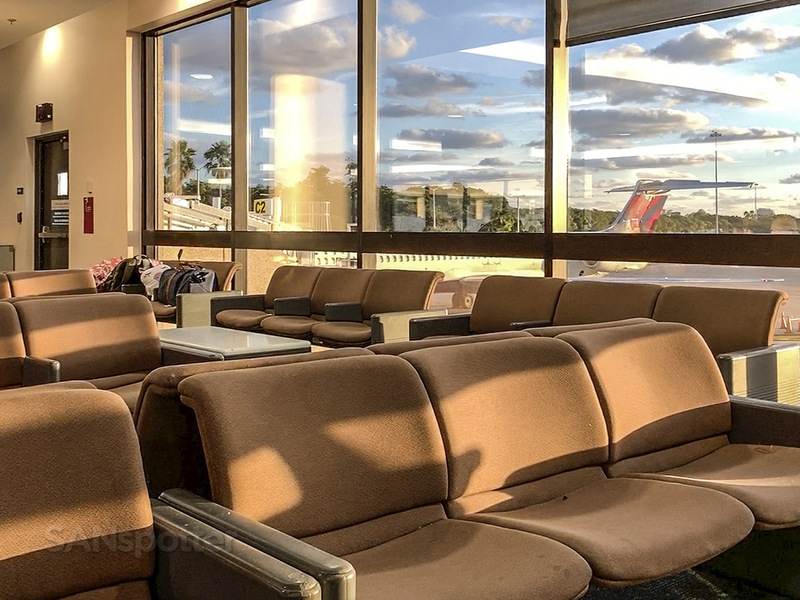 It’s pretty much as perfect as airports get, minus the fact that it doesn’t get the kind of interesting international traffic that MCO and TPA does. 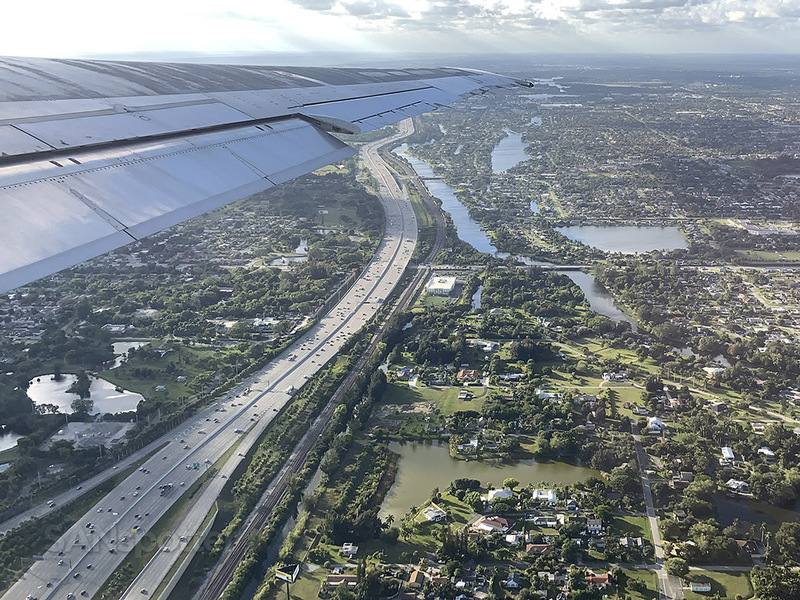 PBI is still a very interesting place to do some plane spotting though, and as a traveler I appreciate it’s compact size and ease of access (in and out). 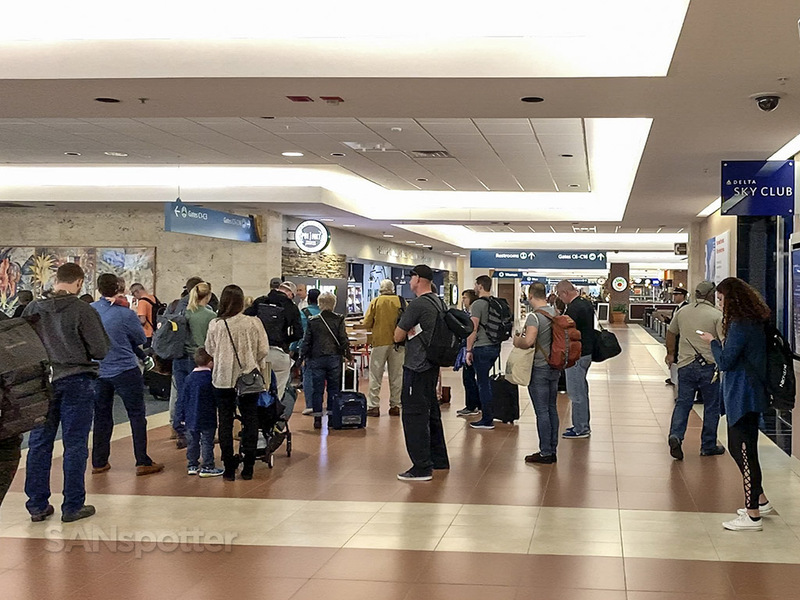 The rental car center is a total cluster **** of course, but for the most part, it’s a friendly airport that I enjoy traveling through. 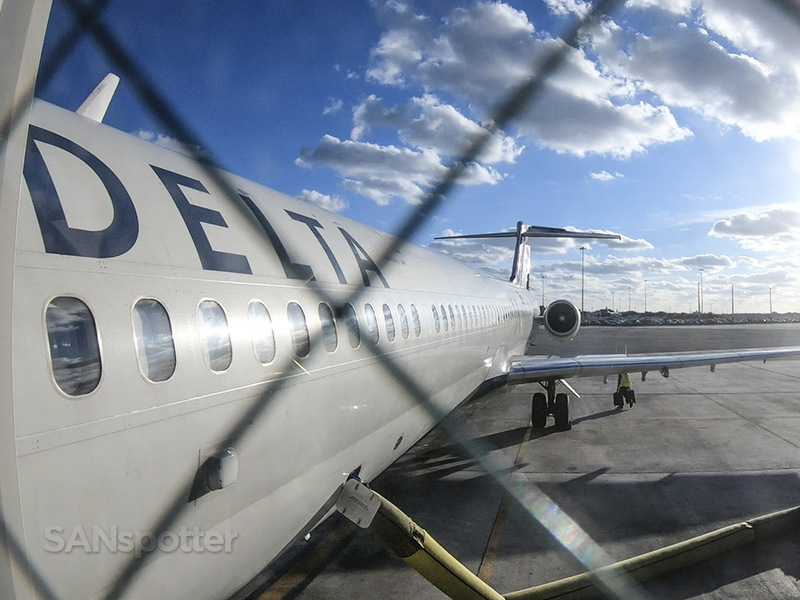 If the lighting is good (and there’s a Delta MD-88 in the frame), it’s a pic that’s going in the trip report. How perfect of a trip report pic is this? I’m even eating oatmeal too (as a way to counteract the horrifically large quantity of unhealthy “holiday” calories I ingested over the past two days). Another pic of absolutely nothing – only because the lighting was magical that morning. Florida sunrises are the best. Ok, yeah, it looks like a shopping mall that hasn’t been updated since 1993. But I love everything about PBI! 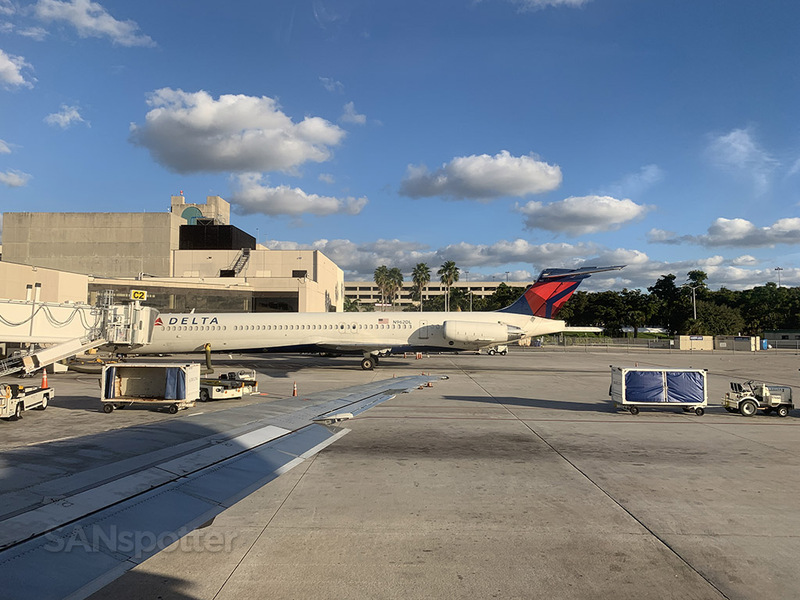 I’ve flown in and out of West Palm Beach on a countless number of Delta MD-88s over the years (the last time was in 2016). 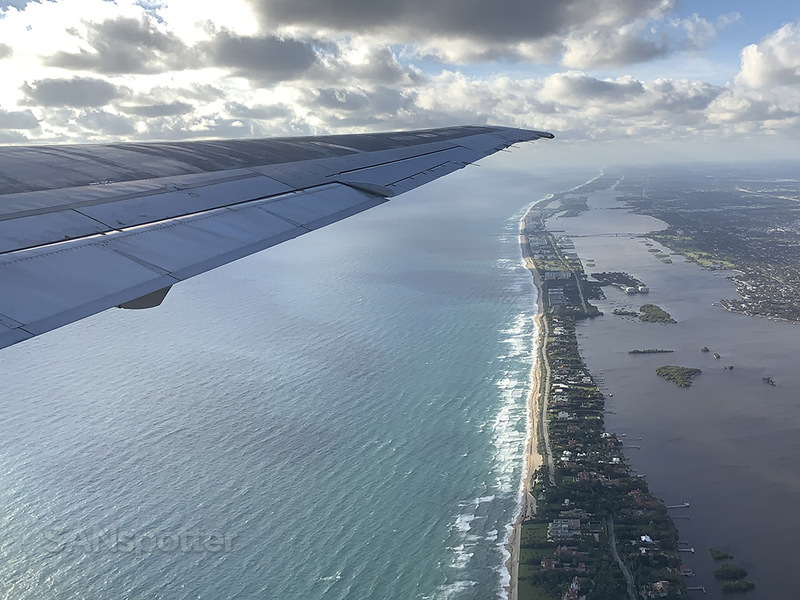 It all started way back in early 2000‘s when my parents first moved to Florida, and they are still the most common aircraft type that I have to wade through whenever I make reservations to fly into this place. Maybe it’s because I live on the West Coast (where Delta MD-88s don’t exist), but I think they’re pretty rad and I try to get a ride on one as often as I can. This quick flight up to Atlanta this morning was no different. The McDonnell Douglas MD-80 series of aircraft is highly underrated in my opinion. In an age where all the commercial aircraft manufacturers can’t spit out anything other than twin-engine copycats of each other’s airplanes, the MD-80 is a refreshing departure from the norm. Since my wife was traveling with me, I think I missed a golden opportunity to hand her the camera stand at the door and wave like every US president has since the 1930’s. She probably wouldn’t have spoken to me for days afterwards though – she’s not as enthusiastic about my trip reports as I am. Now that’s a sparkly airplane. According to the guys at my local car care center, this looks to be the $28 “supreme” wash. Complete with bug remover and tire shine! The thing that I like best about this aircraft is the fact that it’s a 2-3 layout in the main cabin. This is especially nice if you’re traveling with one other person. 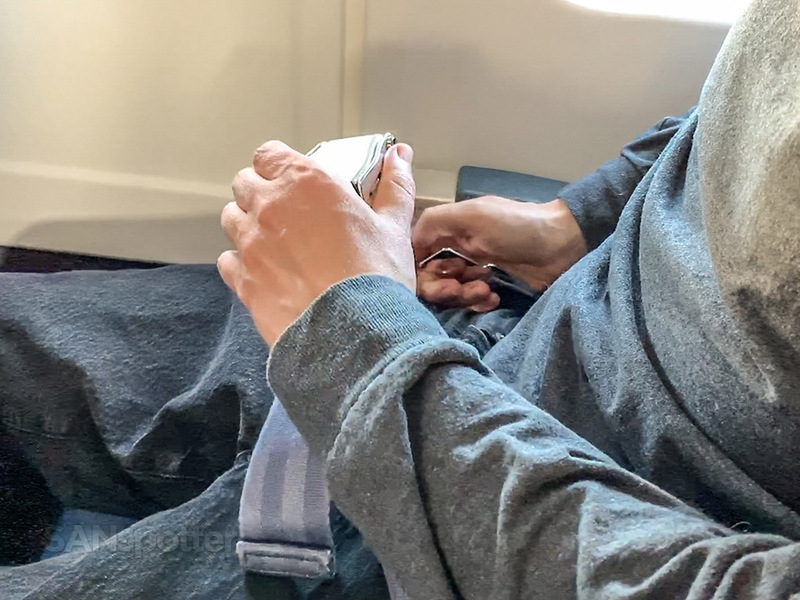 I mean really – how awkward is it to have a private conversation about the severity of the rash on your junk with a complete stranger sitting next to you in the third seat? 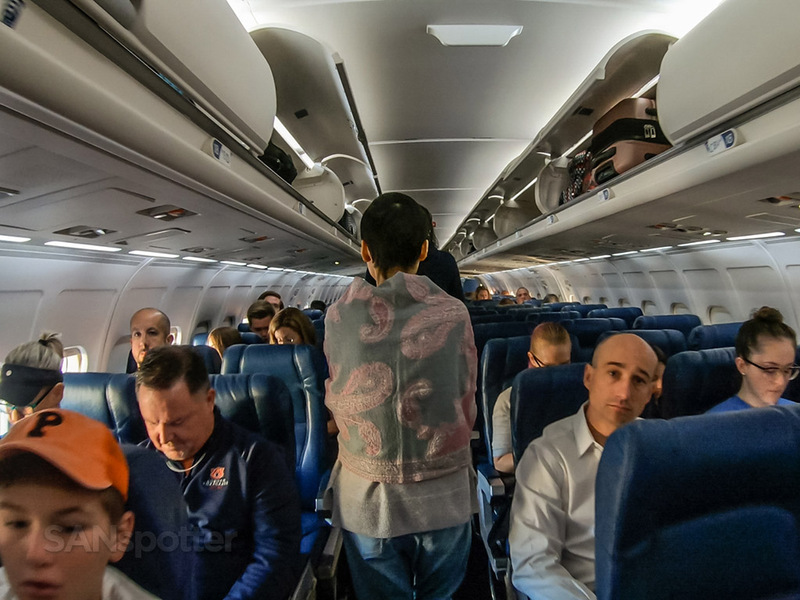 The guy in the white shirt looks really surprised that I’m making a trip report for a lowly MD-88 flight up to ATL. Either that or I’ve got a clump of oatmeal on my face that I missed. You can’t even see the front of the plane from way back here in row 31! All the better if we slam nose-first into the side of a Florida mountain I guess. It pays to be poor economy class dwellers! See? 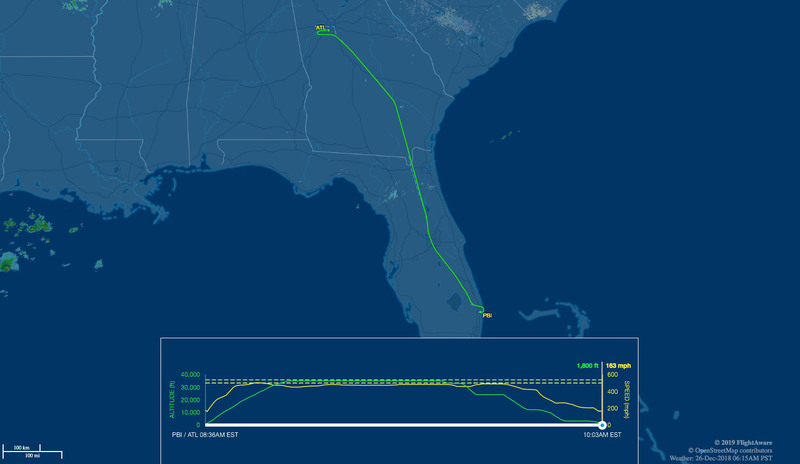 This is what I meant about the PBI/Delta MD-88 connection in my brain. There’s always at least one of ’em here. 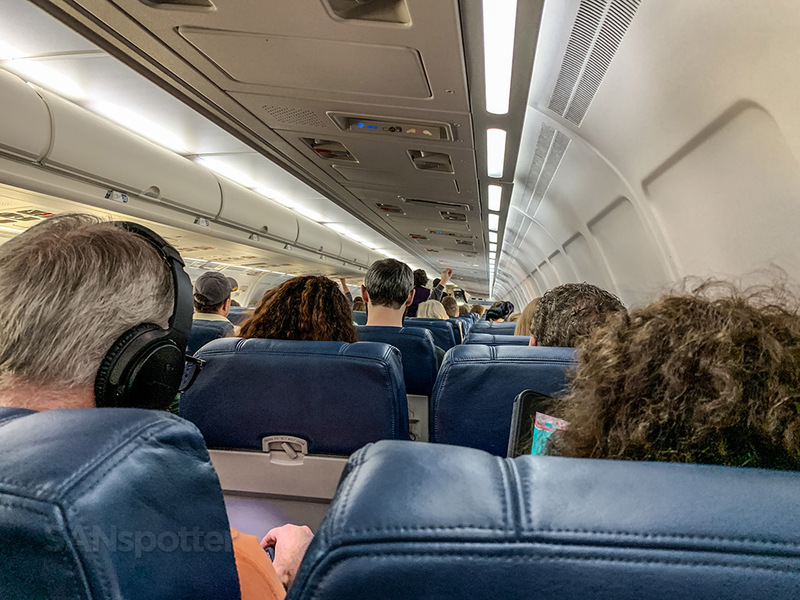 Another nice thing about the MD-88 is the fact that it’s an extremely quiet aircraft – if you’re sitting towards the nose of the plane that is. With the engines located all the way in the back, it’s whisper-quiet up front and all you’ll hear is wind noise. 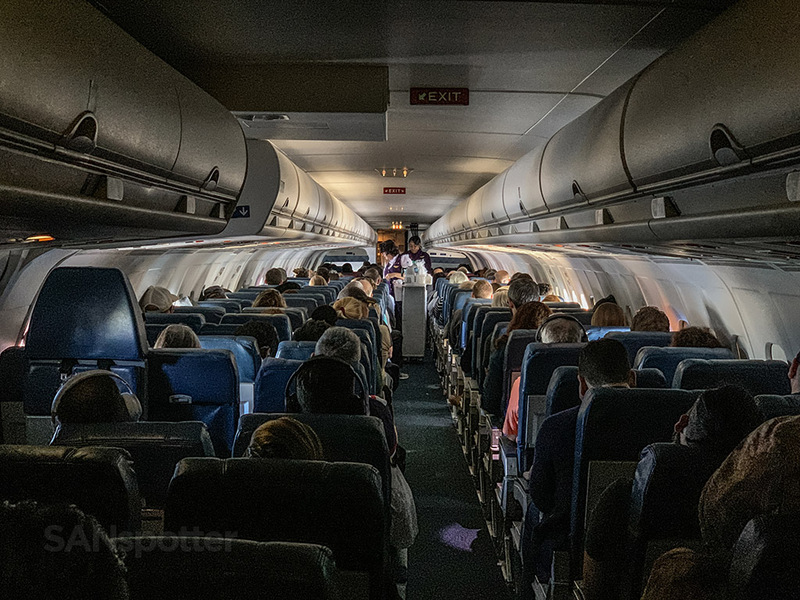 I know – it’s completely horrific if you are a hard-core AvGeek who thinks that jet engine noise is the best thing ever, but for 99.99% of the traveling public, it’s a really nice characteristic of this old bird. If this were 1978, this would be one of those “Whisperliner” 727’s and we’d be shattering the windows in every house you see down there. Ahh, the good old days. Now I wish this was a 727 instead. Dang it, why did I have to mention the Whisperliner?! 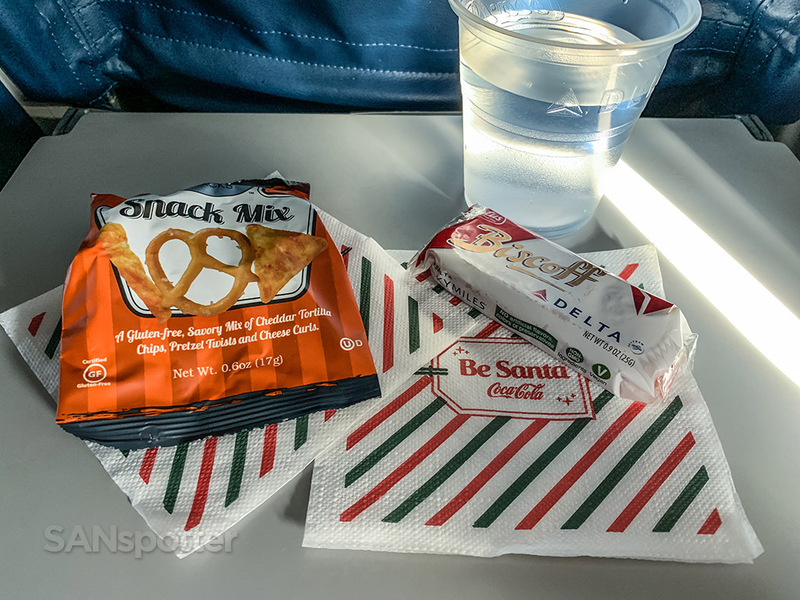 As I sat there looking out the window secretly wishing that the cabin crew would do something fun and exciting to make this trip report more interesting, it occurred to me how good (as a whole) Delta Air Lines has become over the past 5 to 10 years. 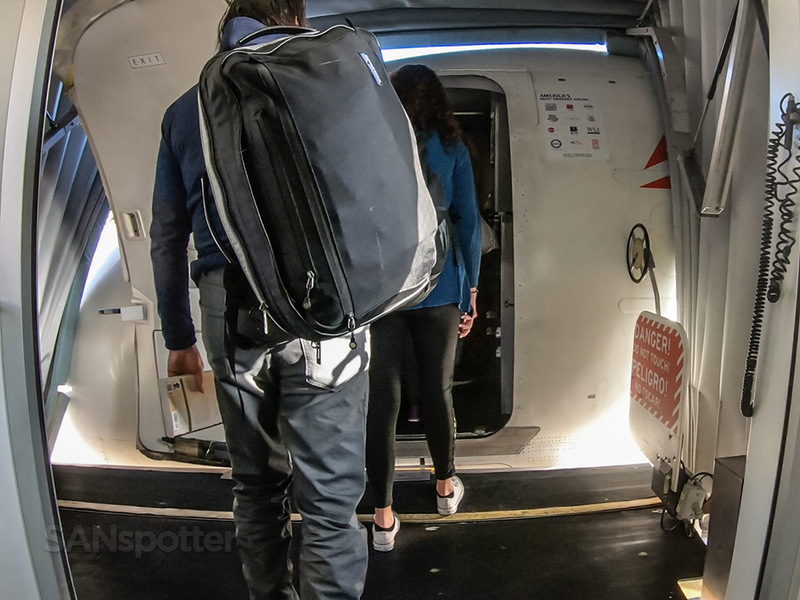 It’s really incredible to think about how much money they’ve reinvested into their products and services, and it seems as if they’ve been listening very closely to passenger requests and demands lately. What other US airline is doing that right now? 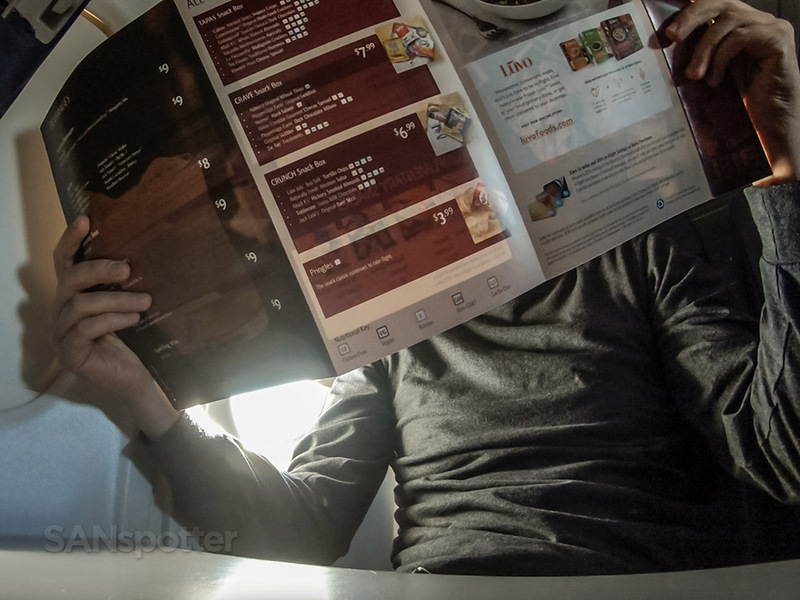 SANspotter hard at work finding the perfect snack for this trip report. Who else flip-flops on the snack choice in your head a million times until the moment they ask “what can I get for you?” It’s gotta be one of life’s easiest decisions, but I swear it’s as difficult as splitting atoms. All that studying and I went for the free stuff. Oh well. I’ll be ready and prepared for the next flight! 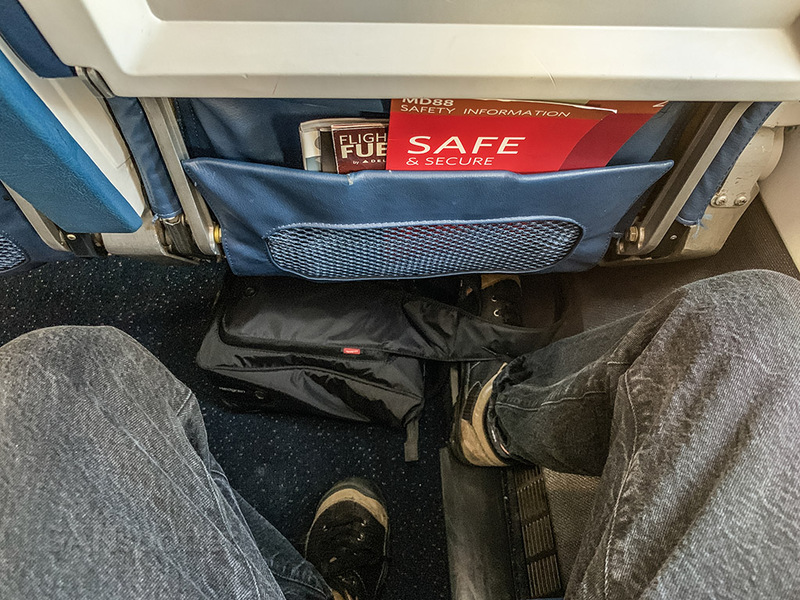 Even though the economy class service on this 1-hour flight up to Atlanta wasn’t very innovative or exciting, I do give Delta a ton of credit for being extremely consistent. Every flight that I’ve taken on this airline over the past five years has been remarkably repetitive and predictable. 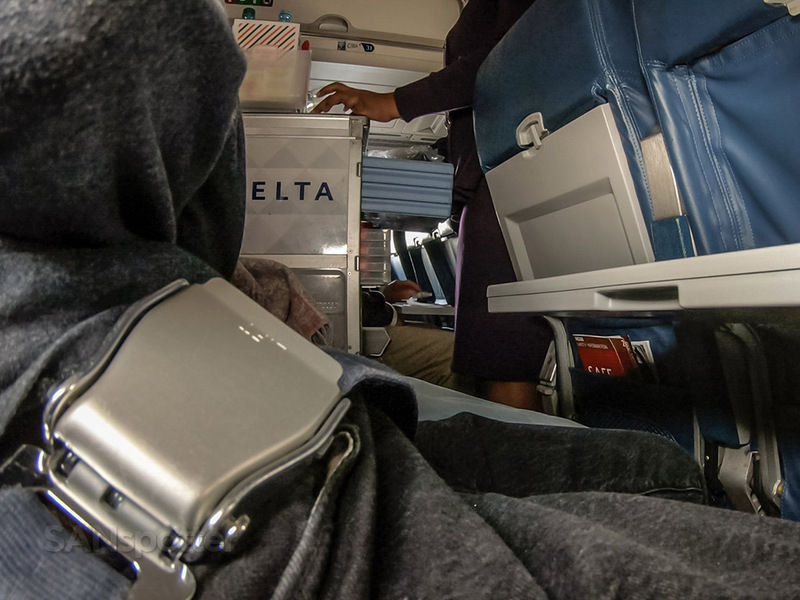 That’s exactly what you want in high-stress activities such as air travel, and I’ll admit that it feels pretty good knowing what to expect before any Delta flight that I take. Bring on the Biscoff cookies! The lavatory was just alright. Cabin crews are extremely consistent between flights as well. 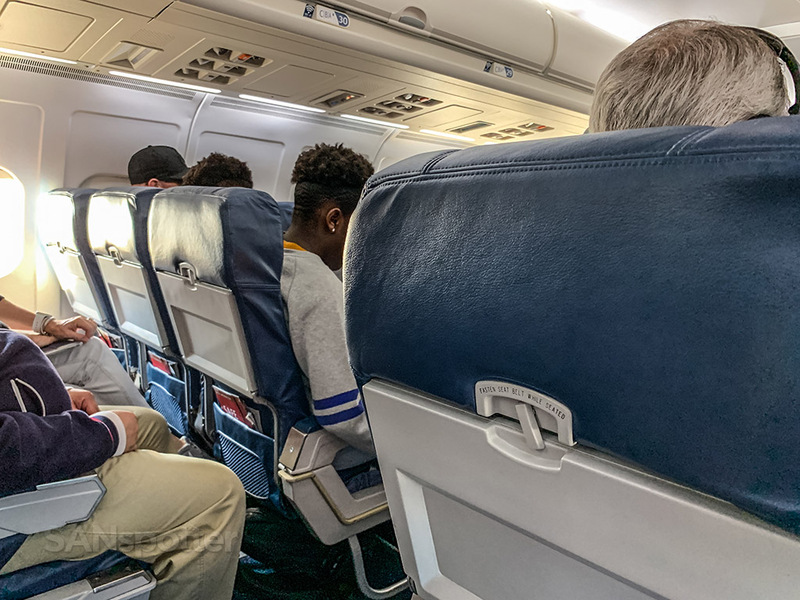 And even if nobody else is saying it, I will: super-friendly flight attendants (both male and female) with thick southern drawls makes for much more enjoyable flight experiences. Just sayin’. 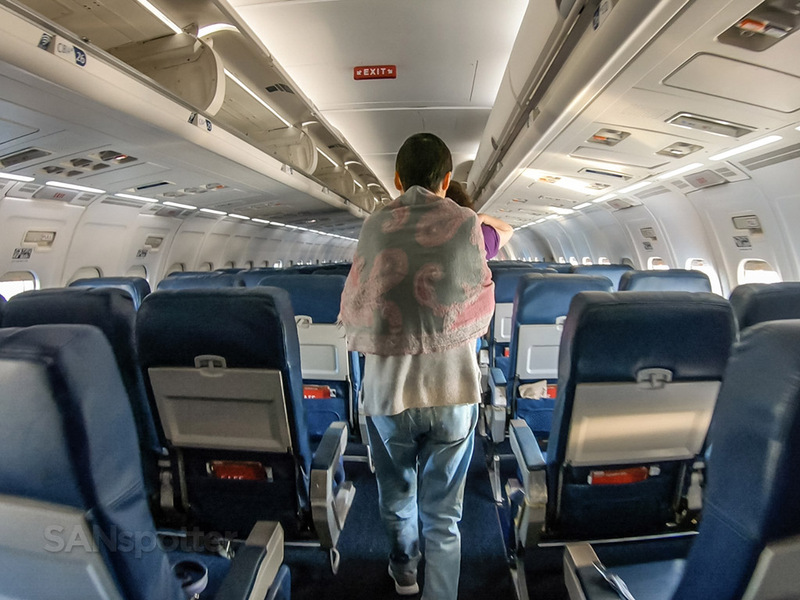 What if this was my last Delta Air Lines MD-88 flight ever? 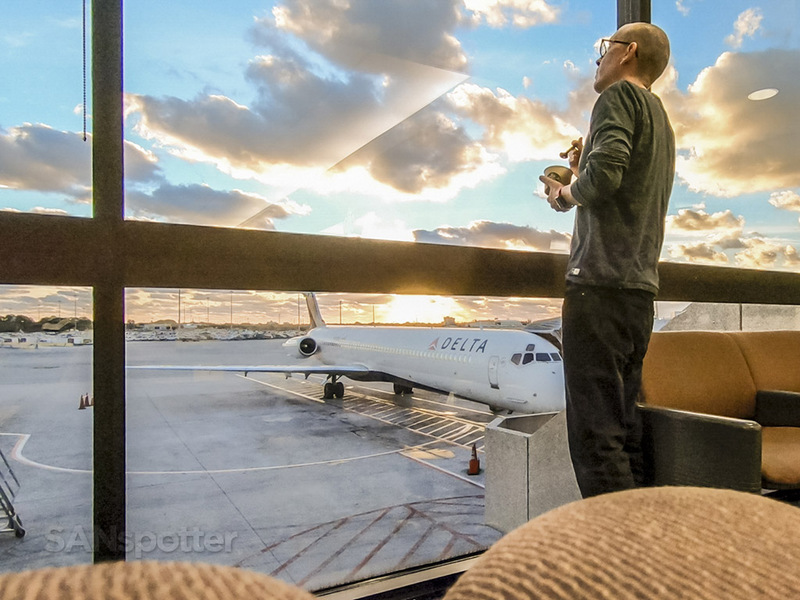 As I wrap up this trip report, I can’t help but to wonder if I missed a huge opportunity to say goodbye to one of Delta’s hardest-working aircraft in it’s history. It’s an extremely unique aircraft compared with today’s overabundance of 737s and A32Xs, and I really believe that she deserves a proper farewell – just as big as the one they did for the 747. The MD-88 may be old and outdated, but it’s an extremely comfortable and spacious regional aircraft IMHO. 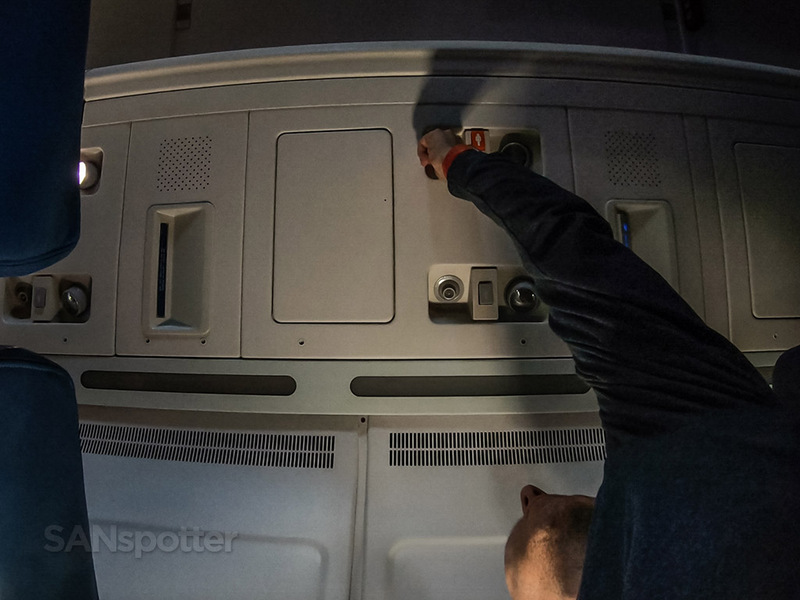 “I can barely reach the ceiling” is something I’ve never said while sitting in a CRJ-200. Anyway, I refuse to say goodbye to the MD-88 right now. 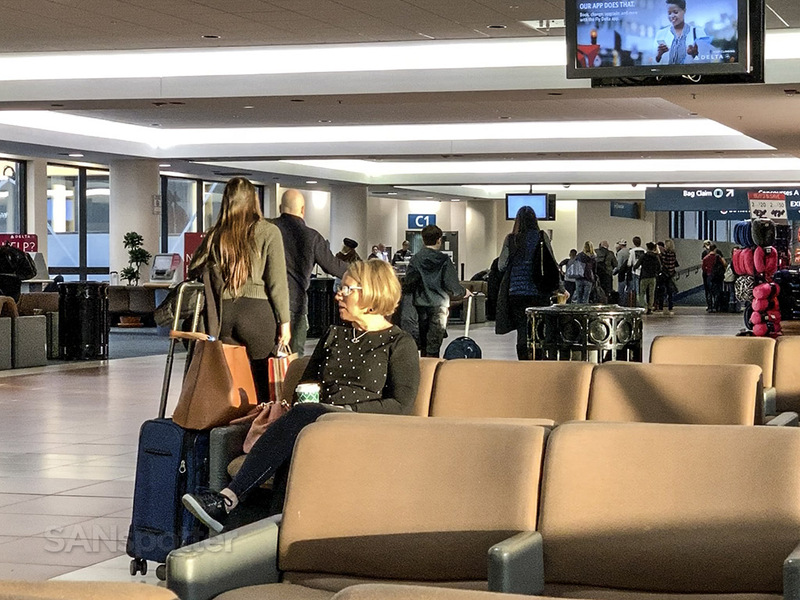 Because if I do, it means that I am inadvertently going to find myself on six more of these airplanes between now and the time that they are retired – and you’ll be really sick and tired of every “farewell” post I write leading up to the grand finale. That’s exactly what happened with my last three Virgin America posts (which you can read here, here, here, and here) and I’ve got a sneaky suspicion that I jinxed myself for saying goodbye so early to that airline. I have a really good backup plan this time though. 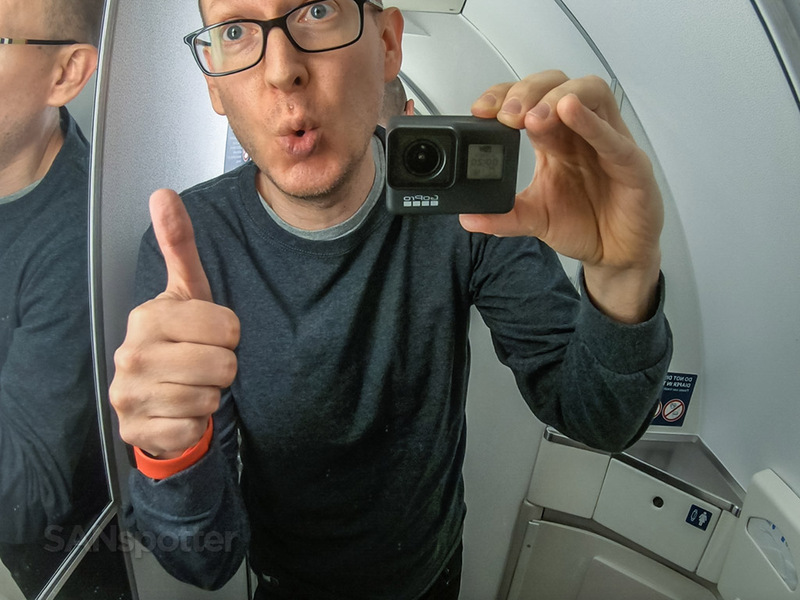 I actually shot a ton of really good video footage of this entire flight experience, and I’m saving it for the Delta MD-88 retirement day (which is scheduled to be sometime next year). If I never do get another ride on one of these things between now and then, I’ll feel good knowing that at least I have all of that fresh footage to edit and upload to YouTube. Any plans for March or April? BTW I will be on a MD-88 to ATL. No plans as of yet (I don’t have anything booked beyond February at the moment). Enjoy the ride on that MD-88! I have taken an MD-83 one time with Alaska Airlines it was pretty smelly. It may have been smelly but I bet it was a lot of fun! Haha! My one and only AS MD83 flight had six passengers (including me) and it was one of the most interesting flights I’ve ever had. 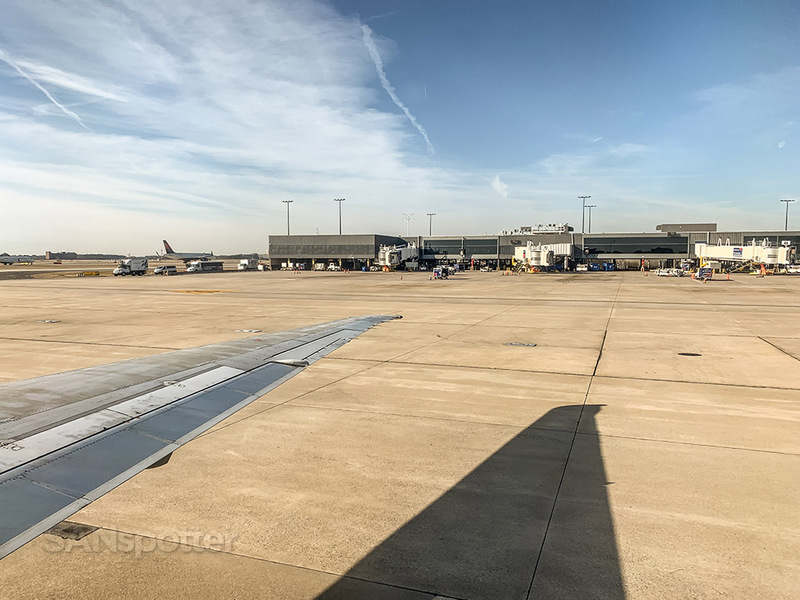 Being the fact Atlanta is my home airport, I have I have become almost numb to the MD-88. I am often fly on this aircraft multiple times a year (as a matter of fact I will be flying one today). Your post definitely reminds me that I need to take a little time to appreciate this aircraft, because soon this longtime backbone of the Delta fleet will be gone. I was (am) the same way with the American Airlines MD 83. It wasn’t so long ago that they were literally everywhere, but now it’s one of the most rare (and endangered) aircraft in the entire AA fleet. The Delta MD-88 isn’t far behind!